Yet another charming issue from the Mercury stable now remastered in superb 3-channel SACD sound. Leroy Anderson has already been given some exposure in Decca's marvellous series when he was included in a four CD box set also conducted by the indefatigable Frederick Fennel. There is not much to choose from these delightful pieces except that they all have wonderful melodies and transport one back to the golden age of American Light Music and the laid back Fifties. 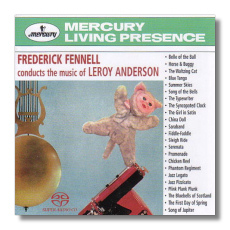 Gems such as; 'Summer Skies', 'Blue Tango', 'Chicken Reel' and Jazz Legato are full of the authentic Anderson touch and Fennell is completely at one with the music's idiom. Notes and presentation are first class as is the astonishing recording from Rochester in upstate New York which is quite marvellous for its 40 year old provenance. I really cannot recommend this issue enough and for all those who are lucky enough to remember those golden years that have gone forever, this collection will definitely bring one or two tears to the eyes.